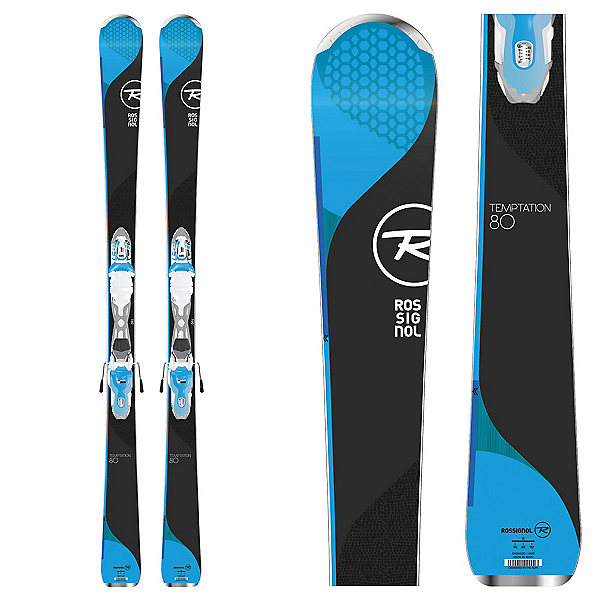 Indulge yourself with Rossignol’s Temptation 80 Skis this winter. Made with an ultra-light wood core and Auto Turn Rocker construction, these sticks will tempt you to push your limits. With a narrow 80mm waist width, these babies excel on groomers, giving you the confidence to master your carve and cut through any variable conditions you may stumble upon. Paired with Xpress 11 Bindings, that can be adjusted to fit a variety of sizes, this is a perfect set up for intermediate ladies. Skier Ability: Intermediate to Advanced: Sometimes these skiers are intermediate, and on a good day, they are advanced, but hard to commit to one level. They can ski most places on the mountain, sometimes with a little difficulty, but always making it down without crying and calling ski patrol. Auto Turn Rocker: Rossignol’s Auto Turn rocker profile is 70% flat camber, and 30% early rise, which means that these skis are going to hold an edge strong, and should be skied mostly on hardpack–but with the raised tips, plowing through crud and powder is definitely do-able. Air Tip Technology: Patented air-honeycomb design reduces the weight and dramatically reduces the swing weight of the ski by nearly 30%. This significantly enhances maneuverability, giving the ski and ultra-light feel. Reinforced with ABS for durability and enhanced torsional rigidity. Extended Sidecut: A sidecut technology that Rossignol uses for its mostly groomer skis. When the ski is going fast and you’re leaning further into your turn, more of the edge comes in contact with the snow the more extreme your angle is. This gives increased edge hold at higher speeds, while leaving the ski maneuverable at slow speeds. Pretty cool. Wood Core: The standard core which has throughout time provided the best performance and durability. Each model may have it’s own density level to help define flex and maximum speed but every wood core ski will be solid.